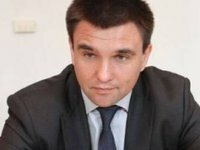 Six sailors from the RS 300-97 vessel detained in Greece in November 2016 have returned to Ukraine, Ukrainian Foreign Minister Pavlo Klimkin has said. "Good news in the morning: Six Ukrainian sailors of RS 300-97, who were forbidden to leave Greece for more than a year and a half, returned to Ukraine last night. Long-lasting, difficult but effective work of the consuls," the Foreign Minister wrote on Twitter on Wednesday, June 27. According to him, the diplomats are working to ensure other Ukrainians' return to their relatives and friends. As reported, the RS 300-97 vessel with seven crew members were detained in Greece in November 2016.